John is now selling his educational videos as digital downloads. This offers a better and more flexible way to distribute these worldwide. John's video downloads are distributed from his new store on the Purple Platform, the leaders in selling and delivering video to all the devices you use. Click here to learn more about the Purple Platform and how to view these videos. Please note: the digital video downloads are sold separately from the other products on John's site and use a different shopping cart. 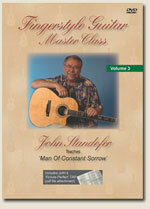 John Standefer Teaches "Man of Constant Sorrow"
In the first two volumes of this series, John taught his arrangements of 'I'll See You In My Dreams' and 'I Am A Pilgrim, both filmed at the Chet Atkins conference in Nashville. In volume 3, John teaches perhaps his most renowned arrangement, 'Man Of Constant Sorrow'. John has recently developed his own film studio at home as well, so you will notice an improvement in the video and audio quality of this and subsequent volumes. As always, the 45 minute lesson gives you insights into arranging the song for guitar, provides a blow by blow description of the arrangement itself and includes John's 'picture-perfect' TAB of the entire piece. Add this classic to your library today! View a different video product by selecting it from the list below. John Standefer Teaches "I'll See You in My Dreams"
John Standefer Teaches "I Am a Pilgrim"
John Standefer Teaches "Dancing on the Ceiling"